For the graham cracker treats: Chop the graham crackers into fine crumbs, reserve. In a medium bowl, microwave the marshmallows on high for 30 seconds. Stir; heat for an additional 15 seconds. Immediately add the chopped graham crackers to melted marshmallows, stir until combined. With wet hands, pull mixture into ½-inch pieces. Place on a parchment-lined sheet pan, ½ inch apart. Allow to sit at room temperature for 5 minutes. For the trail mix: Break the graham crackers into bite-sized pieces. 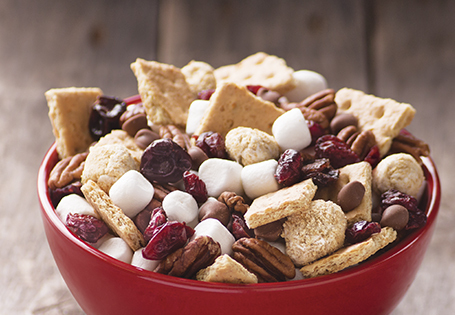 In a large bowl, combine the graham cracker treats, graham cracker pieces, chocolate chips, pecans, dried mixed berries and miniature marshmallows. Store in airtight container for up to 2 weeks.